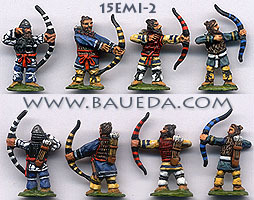 15mm Emishi Figures AVAILABLE NOW! Who were the Emishi? Find out here! Although very little is known of their appearance our figures are as historically correct as possible to the best of our knowledge. 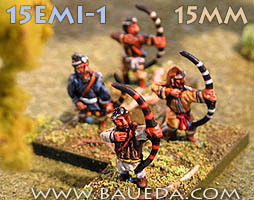 The range is completed by a set of heavier foot archers 15EMI2 and of mounted warriors 15EMI3. 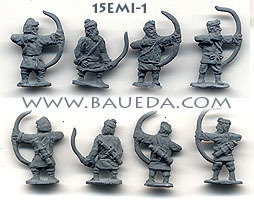 Each pack contains 8 assorted foot archers in four different poses. All figures are sold unpainted! 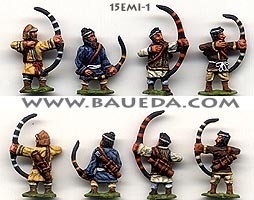 The Emishi were the original inhabitants of the northern Japanese islands, and although very little is known of their appearance our figures are as historically correct as possible to the best of our knowledge. 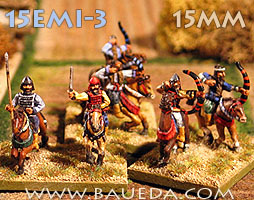 The range is completed by a set of light foot archers best suited as skirmishers 15EMI1 and of mounted warriors 15EMI3. The Emishi were the original inhabitants of the northern Japanese islands, and although very little is known of their appearance our figures are as historically correct as possible to the best of our knowledge. 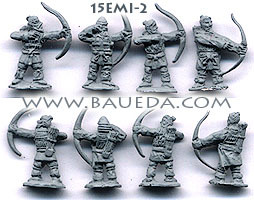 The range is completed by a set of light foot archers best suited as skirmishers 15EMI1 and of heavier foot warriors 15EMI2. 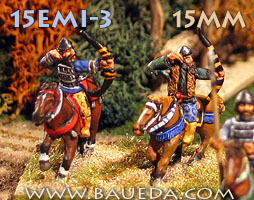 This pack introduce a new original approach to mounted figures; the bottom half of the rider is cast in one piece with the horse, while the top half is a separate piece, which is fixed in place by a peg that fits in a corresponding hole on the mount. This method let you easily mix and match mounts and riders for the maximum variety and also allow the upper half of the body to be glued in almost any position from straight forward, to the side all the way to nearly facing backward in a "Parthian shot". 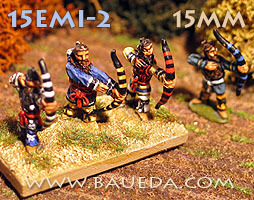 The vast majority of the riders are horse archers but there are also warriors armed with sword and spear in the mix, which are can be used for command elements. Each pack contains 4 randomly assorted horse and 5 riders. The extra upper body part will give you more freedom in choosing the composition of your elements and also let you experiment more freely with conversions! All figures are sold unpainted! TEMPORARILY OUT OF STOCK while we remaster it! PACK CONTENTS VARIES! 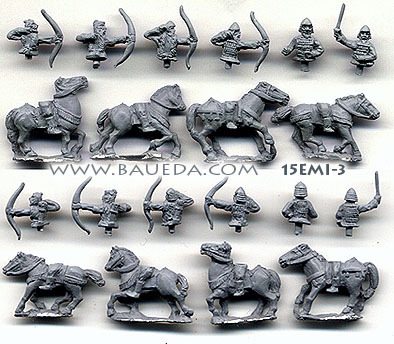 Each pack contains a random selection of horsemen and mounts from the range shown below, enough for four complete figures.